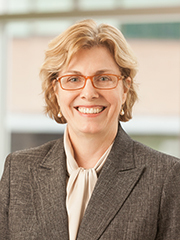 Dr. Jennifer Larsen, was named University of Nebraska Medical Center vice chancellor for research in 2011. She served previously as Division Chief, Diabetes, Endocrinology, and Metabolism, Associate Chair for Research, Department of Internal Medicine and was the first associate dean for Clinical Research for the College of Medicine as well as the founding director of the Center for Clinical and Translational Research and first associate vice chancellor for clinical research. The Louise and Morton Degen Professor of Internal Medicine, she is also an active clinical/translational investigator. Dr. Larsen has focused her research on the metabolic consequences of organ transplantation. She co-authored the American Diabetes Association Position Statement on Pancreas and Islet Transplantation, the 2003 National Kidney Foundation (NKF) task force on Diabetes and Kidney Transplantation, and was a member of the NKF task force for the evaluation of the Living Donor for Kidney Transplantation and a member of the recent international consensus guideline panel for Post-Transplant Diabetes Mellitus (2013). She is also interested in the role of nontraditional risk factors in vascular disease after kidney transplantation. She has worked with many regional Native American tribes to evaluate novel risk factors and effective strategies to reduce risk of diabetes in youth and adults. She served in the past on the advisory committee for the Northern Plains Tribal Epidemiology Center, which is focused on reducing health disparities for the 18 tribes of the Great Plains Tribal Chairman’s Health Board. Nationally, she has held multiple leadership positions within the American Federation of Clinical Research, the Association for Program Directors in Endocrinology and Metabolism, and The Endocrine Society, and been a member of the Endocrine Self Assessment Program of the American Board of Internal Medicine. She has served as the Chair of the Annual Meeting Program Committee for Vice Presidents of Research for the Association of Academic Health Centers and on the council for the Group for Research Advancement and Development for the Association of Academic Medical Colleges (AAMC).